It could be difficult to procure a plane seat near your travel companions this summer. According to a report from the AP, airlines are increasingly setting aside choice seats for frequent flyers and those who pay extra, leaving fewer options for economy travelers. As a result, it’ll likely be tough for travelers to sit together without paying extra during the upcoming peak summer travel season. And those will cost you. On American, for example, a preferred seat (select spots in exit rows or near the front of the plane) on a flight from Boston to London costs $59 each way. This kind of pricing is now standard with most airlines, many of which have recently increased their proportions of for-fee coach seats, reports the AP. As you can see, there’s no place to put a couple—let alone a family—unless one is willing to pay $29 to $39 for an economy plus seat or upgrade to first class. New York to Orlando is a popular route in June, so there’s naturally going to be some competition for seating. 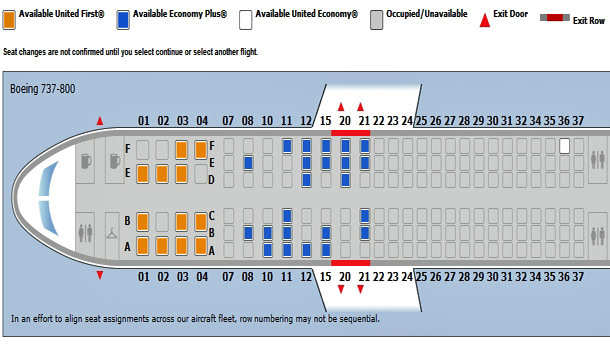 But there’s no way to tell whether or not United has grayed-out seats that are really available in this case. The airline certainly could if it wanted to. There’s nothing stopping it. Travelers can avoid the high costs of for-fee economy seats by booking as early as possible. Several months out is ideal, especially during the busy summer travel season. If you’ve already booked, check the seat availability for your flight a few days before departure, as airlines often upgrade frequent flyers to available business- and first-class seats at this time, leaving more economy seats unfilled. Is it fair for airlines to hide available seating in order to get travelers to pay extra? Share your thoughts in the comments.